The Cleax are entirely non-humanoid beings with long stubby bodies and 16 very stubby legs which drag their slug-like bulk across the ground. They have no 'hands' to speak of, but instead a large collection of short appendages to manipulate things with and emit toxic gas with. 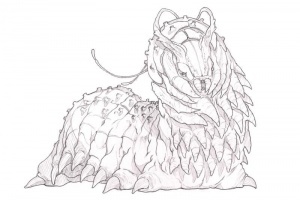 They also possess a terrifying-looking maw and long, flowing antenna. There is a second form of the Cleax, however, called the Sarkeen. We do not know what the Sarkeen are. We don't know if they rule the Cleax, as some have speculated. We don't know if they are even the same race as the Cleax, though it is believed they are, and they are typically referred to as such. Do the Sarkeen begin as a normal Cleax, and evolve? Were the Sarkeen intentionally mutated by the Cleax? Are they nothing but extreme genetic outliers among their race? We don't know. What we do know is that they are the greatest weapon the Cleax possess. A Sarkeen looks like an absolutely massive, mutated normal Cleax, with a gaping maw, multiple long tentacles that look like mutations of the many ‘arms’ of a normal Cleax, and long tentacles. Although we've never captured one, they appear to move via some kind of internal plasma railgun system. They generate plasma, somehow, and then shoot it out of orifices on their body at incredibly high speed, though using what mechanism, we don't know, propelling them forward. They're similarly able to deal immense damage by firing near-steady streams of plasma at opposing starships through their multiple tentacles, each of which is centrally controlled by the Sarkeen's single brain, and which act together with perfect coordination. The Sarkeen protect themselves in a variety of ways - they can generate powerful bio-electric fields that act as shields and that is widely believed to be a product of their own flavor of star kith, they can release swarms of incredibly destructive clouds of 'spores' that attach themselves to any metal object and quickly begin reducing it to component atoms, and they're able to generate singularly powerful EMP (electro-magnetic pulse) bursts to disable nearby ships or drones. 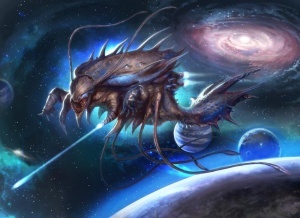 The Cleax have invaded Starmourn Sector three times: the First Cleax Invasion in about 900,000 B.E., the Second Cleax Invasion in 3202 B.E. following the destruction of the Sheol Locus, and the Third Cleax Invasion in 574 A.E. We know that both the Oteel and Nath-el races are the result of genetic seeding by the Cleax for unknown reasons in the First Cleax Invasion. Little is known about the culture of the Cleax except that their way of thinking is completely alien to that of any race inhabiting the Starmourn Sector. This page was last modified on 8 August 2017, at 01:46.